Ridge and valley topography forms one of the most ubiquitous patterns on Earth’s surface, but current experimental methods cannot predict the evolution of convex topography. In collaboration with Dr. Chris Ellis at St. Anthony Falls Laboratory, I designed and implemented a novel apparatus to induce realistic diffusive hillslope transport in a meter-scale laboratory experiment, the eXperimental Landscape Module (XLM). The first video below shows the evolution of an experiment with no hillslope diffusion, and the second shows an experiment with hillslope diffusion. Our results show that the strength of hillslope transport relative to channel incision controls the scale of drainage basins. Paper in Science; coverage by the Washington Post and Der Spiegel (German). I am working with a LIDAR dataset of a lava flow in the High Cascades of Oregon to test theoretical, mechanistic models of bedrock incision. Collier lava flow erupted 1600 years ago from Collier Cone on the north flank of the North Sister stratovolcano. Since then, a fluvial channel has been carved up to 11 m into the lava, despite the high permeability of the young, blocky lava flow. 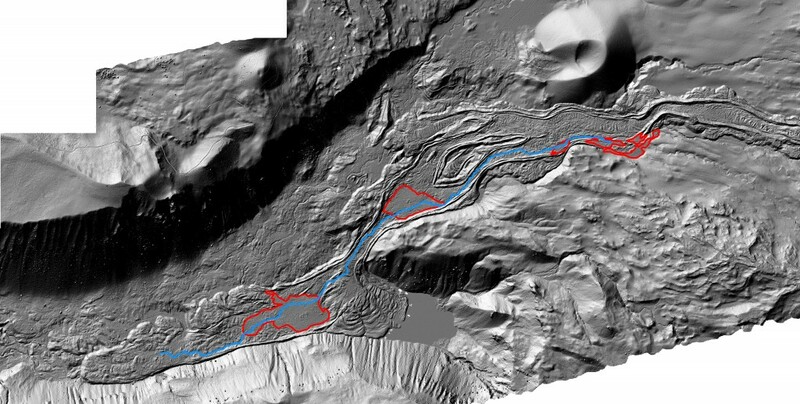 Excellent elevation data, strong age controls, and near Himalayan rates of erosion enable me to reconstruct the pre-incision surface and forward model stream channel evolution using different formulations of bedrock incision. The extent of soil weathering depends on parent material, topographic position, vegetation, climate, and erosion rate. Where soil-forming factors can be assumed to be relatively constant between sites, measures of soil weathering can give us information about the relative rates of erosion. I am using soil samples collected from two watersheds in the Oregon Coast Range to (1) assess the scale of variability around topographic steady state and (2) examine patterns in soil residence time that may arise from transient landscape processes such as drainage migration. I am currently working with a recently acquired Lidar dataset to explore links between my soil residence time measurements and local topographic metrics (e.g., hilltop curvature) within the North Fork Smith River watershed. Paper in Geology, 2012 , and related Research Focus.